Subscribe PS Review of Freemasonry DVD & Books Alerts are email updates of the latest DVD & Books reviewed on this site. Also available with subtitles in Italian, Spanish, Portuguese, German, Dutch. The Scottish Key. An Investigation into the Origins of Freemasonry. An enigmatic and mysterious topic, subject to allegations and fantasies of all sorts. Spread across the globe, this discrete and mysterious association has been a source of curiosity, fascination and suspicion for over 300 years. Today Freemasonry gathers several millions of people throughout the world. Protected from the outside world, from which they isolate themselves for the length of an evening, freemasons meet in lodges and there develop a peculiar spirituality. How was this movement born? Are its origins veiled in secrecy? Even amidst its own members, few know the actual beginnings of Freemasonry. The lodges themselves have forgotten from whence they came. For the first time, based on the most recent findings, a critical documentary investigates the question of the origins of Freemasonry. What are its links with the Knights Templar? Are they the descendants of stone masons from the Middle Ages? How did the first lodges come to be? Take an esoteric road of unsolved mysteries, starting in England in the 18th century. Discover the events that led to the creation of the Grand Lodge of London in 1717. Ascertain the true ambitions of the men who launched this incredible adventure, and how the most intriguing fraternal society of modern times was born. Explore the centuries old stone mason lodges and their ties to the birth of Freemasonry in London. See how these men were inspired by their secular rites such as the mason’s word and the art of memory. Find out the roots of Freemasonry in Scotland, and the real influence of the Middle Ages. Tristan Bourlard directed films, documentaries and television shows for 15 years. In 1994, he received the « Prix Européen du Meilleur Film Scientifique » at the « Festival Scientifique de Palaiseau » in France for « De Mercator aux satellites, histoires cartographiques ». In 1999, the documentary « Matamata et Pilipili » received the « Contribution Award » at the « Margareth Mead Film & Video Festival » in New York. He’s also directed six documentaries for two thematic evenings on ARTE. In 2002, he directed the historical and scientific documentary « La place du mort » for the RTBF and received the « Premier Prix du Film Pédagogique » at the « Festival du Film Archéologique Kinéon » in Brussels. François De Smet was born in 1977. He studied Philosophy, before working for several years in the political sphere, and conducting research in political philosophy at the « Université Libre de Bruxelles ». He is the author of « Les Droits de l’homme: origines et aléas d’une idéologie moderne »  and numerous articles on racism, cultural diversity or citizenship. Andrew Prescott was appointed as first Director of the Centre for Research into Freemasonry in the University of Sheffield in 2000. Andrew has lectured and published widely on the history of freemasonry since the establishment of the Centre in 2001. Keith Moore is Head of the Library and the Archives of the Royal Society. Roger Dachez is director, since 1992, of the review for masonic studies, “Renaissance Traditionelle”. He is currently president of the “Institut Maçonnique de France”. Jessica Harland-Jacobs is assistant professor of history at the University of Florida. She recently published Builders of Empire - Freemasonry and British Imperialism, 1717-1927. David Stevenson was the first professional historian to study the records of the early lodges of freemasonry in Scotland, publishing 'The Origins of Freemasonry. Scotland's Century, 1590-1710' in 1988. Ewan Rutherford was Venerable Master Mason at the Mary Chapel Lodge in Edinburgh, Scotland, one of the oldest in the world. John Hamill is Director of Communications for the United Grand Lodge of England. He is a past Grand Lodge Librarian and Curator (1993-1999), and a Past Master of the research lodge, Quatuor Coronati Lodge No. 2076 (1995). Robert L. D. Cooper has been the Curator of the Library and Museum of the Grand Lodge of Antient Free and Accepted Masons of Scotland for 14 years. He is the author of: The Rosslyn Hoax?, Cracking the Freemason's Code. This well documented and professional directed film is a genuine historical investigation about the origins of Freemasonry: no fanciful hypotheses, no speculative allegations but facts against fiction. Some authors states that Freemasonry is descended from the Medieval Order of Knights Templar or from the Alchemists but it is an hypothesis, even although many writers claim to be able provide evidence thereby making it a theory. Sadly, nearly all such evidence used is not valid evidence at all but is merely material which has been manipulated or reinterpreted to make it appear to support the hypothesis. The reality is that we have no written documents about the foundation of the first Grand Lodge in 1717, no evidence that the members of the four lodge meeting at Goose and Gridiron Tavern were the successors of the operative stonemasonry which transmitted them its rituals. John Hamill says that "the analysis of the context in England at 1717 demonstrate that the operative lodges had disappeared since a long time, whatever the four London Lodges were at that time, it is established that they could not have been the successors of the Stonemason's Lodges". 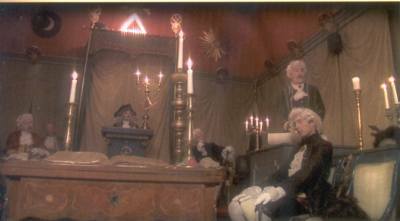 In order to understand the sources of Freemasonry the film goes back to the Scottish stonemasons at the end of the 16th century where for the first time gentlemen were admitted in the stonemasons' lodges. Bob Cooper calls William Schaw as 'The Father of Freemasonry' and 'The First Modern Freemason'. But why is Schaw so much relevant for Freemasons? Because William Schaw (c.1550-1602) is of crucial importance in the process of the transition from stonemasonry to modern Freemasonry. The reasons are simple. Stonemasons’ lodges existed all over Scotland and in 1583 Schaw became responsible for them. He was a senior civil servant and formalised what seems to have been a very loose confederation of lodges, which had no set rules and no set procedures. Schaw changed that by writing the now famous Schaw Statutes of 1598 and 1599, which set down specific rules and regulations for all Scottish lodges. 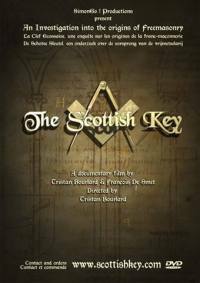 The transition from stonemasons’ lodges to modern speculative Masonic lodges is well documented in Scottish records, and that's why I assume the authors Bourland and De Smet entitle the film 'The Scottish Key'. This remarkable documentary film not only investigate the origins of Freemasonry, it shows us what freemasonry is: an initiation-based society which people enter in order to have socials contacts with other human beings in an environment - the lodge - where religious, political and cultural differences are put aside, all this to promote the moral idea to make good men better.